Melissa White joins Dr. Tom Hansen as part of State of Franklin Healthcare Associates’ Interventional Pain Management team. 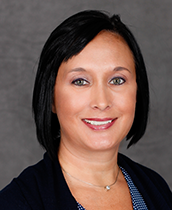 An East Tennessee native, Melissa earned bachelor’s degrees in Public Health and in Nursing as well as a master’s degree in Nursing from East Tennessee State University. As a nurse practitioner, Ms. White has experience in the ER, ICU and in Clinical Administration. She has spent the last seven years of her career in pain management where she enjoys evaluating patients and making recommendations to help them manage acute and chronic pain. Using the Tennessee Chronic Pain Guidelines, Melissa establishes a plan that includes treatment or modalities beyond opioids. Her goal is to improve her patients’ function while reducing their pain. When she is not helping people manage their pain, Ms. White enjoys spending time with her husband and two sons, attending church services at Tri-Cities Baptist Church, cheering her sons on at their basketball games, and having a good laugh.